Happy smart watch day! Let's have a hearty welcome for our newest party guest: Qualcomm. That's right, the Snapdragon chipmaker will be peddling its own watch—the Toq—direct to consumers. And it's a way different take than Samsung's Galaxy Gear. On the spectrum of standalone to accessory, Qualcomm's Toq skews enthusiastically toward the latter. 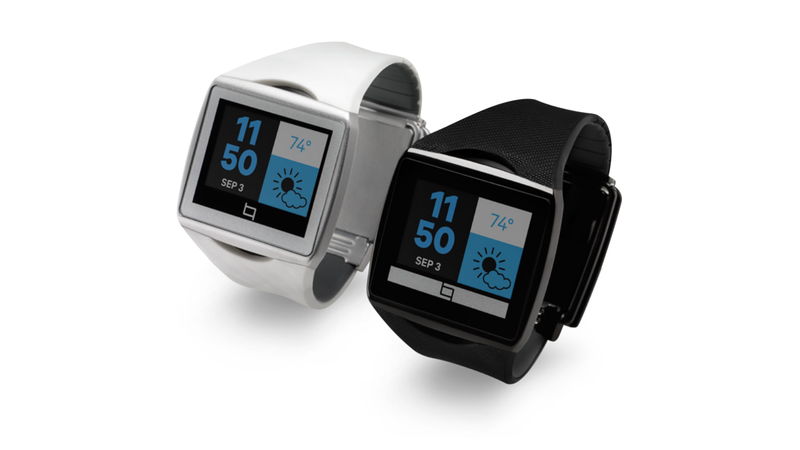 Think "watch (or even a Pebble) on steroids" not "phone on your wrist." Where Samsung's Gear takes something of a more-is-more approach when it comes to functionality, Qualcomm's Toq is minimalist to the max. The Toq's 1.5-inch display is a low-powered Mirasol panel—tech initially bound for color eReaders that minimizes the need for backlighting by looking great in direct sunlight. The capacitive touch screen minimizes to one swipable strip on the bottom when not in use to save power. For connectivity, it relies on Bluetooth. There's no Wi-Fi radio or data connection to burn power here. Or speakers. Or a mic. Or a camera. The table isn't completely bare though; there is an accelerometer inside, so it can theoretically do some basic fitness tracker stuff. Eyeballs On the Kyobo eReader and Its Mirasol Display: Color! Video! Disappointment! The payoff? The Toq has a battery life that Qualcomm claims is around two days. It's not forever, but it's not bad for something with a full color touchscreen display. Even more impressive, the Toq pulls this off while being an always-on device; it doesn't have an off button. So long as Toq actually lives up to these high standards, it far exceeds the minimum requirement of any good device: one long, busy day. And that's all you really need, right? When chargin' time inevitably arrives, the Toq can juice up with the help of its stand/carrying case that doubles as a wireless charger, using Qualcomms proprietary WiPower tech. Oh, and that's not the only thing that sits in there and charges; (at least one flavor of) Toq comes with two Bluetooth earpieces that team up to form a pair of wireless 'buds. You know, because future. With no Wi-Fi to speak of, the bulk of the Toq's functionality (besides showing the time like a watch) comes from being paired with an Android phone running 4.0 or higher. Through an accompanying Android app, users can control what notifications are routed to the watch; anything that lives in the notification tray is eligible. On the device, options for interaction—besides reading—are fairly limited. Fire off one of a list of pre-written text messages, confirm calendar appointments, pick up incoming phone calls, sure. But don't expect to hammer out any emails or surf the web; the interface is based around stacks of "cards" you swipe away one by one. It's simple by design and very intentionally not Android. The Toq isn't a hulking monstrosity. It's biggish, but mostly to accommodate screen real estate. It's not "clunky." Wiring in the flexible band lets the battery proper live on the back clasp without turning the whole thing into a full-on bangle. And with its relatively modest innards, the display is able to stay relatively thin. It's as sleek as you could reasonably hope for at this stage in the game. Qualcomm's been known to make the occasional functional mock-up to send around to hardware partners, but this time its going a little further. Toq is very much intended to illustrate the possibilities of smartwatchery to all the hardware companies raring to jump into the game, but it'll also be made available to the public in limited quantities, with the possibility of a ramp-up if it really takes off. We had a chance to spend a little time with the Toq, and like most of these first-gen smartwatches, it isn't mass market product. Its capacitive touch screen can be a little iffy from time to time, and it looks very much like a smartwatch. A nice one, but it still has a vaguely calaculator wristwatch vibe. Still, it does have some promise as an early-adopter toy for wearable tech dweebs who were never quite satisfied at the prospect of a Pebble. Whether that's enough for it to change the shape the course of our smartwatch future remains to be seen. So far there's no information on availability or price, but you can go throw your email address at Qualcomm to get notified as soon as the news drops. As for us, we're hoping to get some extended playtime with one soon, to find out how much more less can really be.